Dr. Newsome's clinical specialties include uterine fibroid embolization, ablative and catheter-directed treatments for cancer, among others. 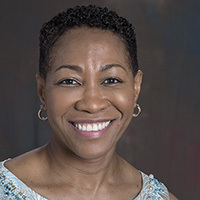 Janice Newsome, MD, is an Assistant Professor in the Department of Radiology at Emory University School of Medicine and Site Director of Interventional Radiology Services at Emory University Hospital Midtown. Dr. Newsome is an interventional radiologist with interests in uterine fibroid embolization, ablative and catheter-directed treatments for cancer, vertebral augmentation, treatment of deep vein thrombosis, pulmonary emboli, and complex peripheral arterial disease. Prior to joining the faculty at Emory University School of Medicine in July 2015, Dr. Newsome was in private practice in Virginia for 14 years. Dr. Newsome is an active member of the Society of Interventional Radiology, the Southeastern Angiographic Society, and the American College of Radiology. Dr. Newsome received her MD from Mount Sinai School of Medicine in New York, New York. She completed her residency training in surgery and diagnostic radiology at Medical College of Virginia, Commonwealth University in Richmond, Virginia. She then completed a fellowship in vascular and interventional radiology at Miami Cardiac & Vascular Institute in Miami, Florida.